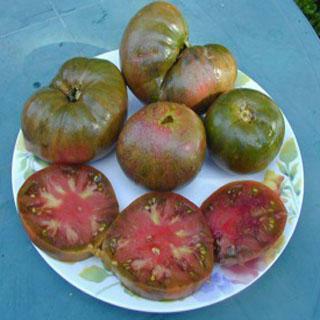 These tomatoes have gorgeous olive and metallic-like russet skins surround sweet garnet and purple flesh. Fruits average around 8 oz. Very productive. Heirloom Seed Packet. Gorgeous olive and metallic-like russet skins surround sweet garnet and purple flesh. Fruits average around 8 oz.